Some years ago, I was called for jury duty. At the time, I was busy working as a therapist at a mental health center, and didn't want to take the time I thought would be needed for jury duty. My supervisor wrote a letter to the judge asking for my release from duty. I drove to the county courthouse and gave the letter to the judge's secretary. She asked me wait until the judge was available. From my vantage point in the waiting room, I could look directly into the judge's office. His back was to me and I could plainly see that he was working on his computer. Upon closer examination, I noticed that he was playing Solitaire! Two of his assistants were helping him. As a side note, if you're ever stranded on a deserted island, start playing Solitaire, because someone will come along and tell you how to play. As the judge was playing his computer game, I watched as the secretary approached him and told him about my request (the entire office was fairly small). He nodded his head and kept playing Solitaire! He kept playing the game until he won! Needless to say, I was a little frustrated at having to simply wait while someone finished a game. What kind of situations frustrate you? What are potential ways to reduce the frustrations that you experience? I believe that increasing our levels of patience can at least help us tolerate frustrating situations. Until the mid Nineteenth Century, the process to mail a letter or package from one location to another could take from weeks to months. The only way to send a letter to another part of the world was by ship. In the United States, the Pony Express and stage coaches were used to transport mail. From the invention of the telegraph until today, the speed with which we expect to receive information has decreased substantially. Today, if we don't receive a text message back from someone or a confirmatory e-mail, we wonder if they received our messages or are ignoring us! How does one develop an attitude of patience? How can we demonstrate patience to others? I believe that we can find encouragement from the Bible to help us become more patient. 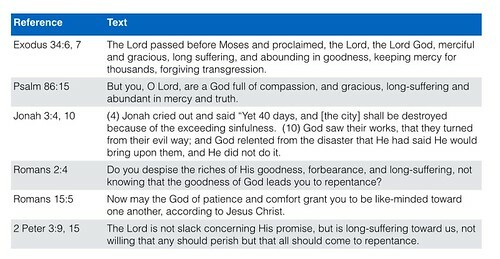 The key word that is included in most of these texts is "long-suffering," which is really a synonym for "patience." The dictionary definition of patience is "1) an ability or willingness to suppress restlessness or annoyance when confronted with delay, 2) quiet, steady perseverance." To me the secret for an increased level of patience is attitude of forgiveness and lack of expectations about the behaviors of others. When someone does something that I don't like, I must remember that I can only control my own actions, and then forget about their actions. If I had contemplated this years ago when waiting for the judge to finish his Solitaire game, I would have been more content with my wait. When you find yourself becoming impatient or frustrated with others, I encourage you to think about the "fruits" listed above and how God is patient with us. I believe you will experience less anxiety over situations and become more patient.